Thrilling urban dystopian fiction debut from exciting young author. On her Choosing Day, Beatrice renames herself Tris, rejects her family’s group, and chooses another faction. 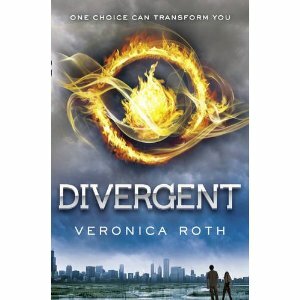 After surviving a brutal initiation, Tris finds romance with a super-hot boy, but also discovers unrest and growing conflict in their seemingly “perfect society.” To survive and save those they love, they must use their strengths to uncover the truths about their identities, their families, and the order of their society itself." I was very fortunate to have been sent an ARC of this. I was so excited when I opened the package - I had no idea I was getting it!! Firstly the cover. Very eye catching. Gives you a good idea of what the setting is, so you can picture it just that bit easier. I generally find with dysotopian books, that I picture kind of medieval settings. I have no idea why I do this, but my strange head does. It was just that bit more helpful to have a picture to refer to. I found the idea of this book amazing. I already find it hard when I think of people making decisions about college courses or jobs at 16, but this books takes it even further in that you make the decision & that is final. You're only alternative to choice, is to basically become what is considered the dregs of society. Whilst reading I thought of the people in factions as Upper Classes & the factionless as working class. I hope I'd fit into a faction, but would be terrified of ending up factionless, as I quite possibly would! The use of factions for the book is such a great idea too. I can already imagine my book friends and I, discussing which faction we're in & who's better. Oh I do love our book fangirling! There is A lot of anticipation building with the book, which seriously got my heart racing. I honestly had no idea where the story was going to go to next, this made it really hard to put down & get sleep though - I warn you!! It was very enjoyable to read Tris' thought processes. The way she solves life's puzzles and sorts out her predicaments, absolutely fascinated me. I should learn from her for sure! I do have to say that the story is quite harrowing and dramatic at times & although I did really enjoy the story (seriously I did) I couldn't quite understand why anyone would stay where they were, enduring what they were. I guess this shows more of my cowardice or maybe just how brave the character of Tris is. There are such huge twists in the characters. It was deeply shocking. I really didn't expect for some of them to act the way they did. It really does keep you on your toes. As with most YA stories there is a budding romance & a dreamy guy. But the dreamy guy (Four) in the book is my new FAVOURITE! OK I know I do say this a lot, but I think this is the one. Four I LOVE YOU!!! Please can you materialise in my home town & become my beau??? I will even try and become a domestic goddess for you, and that is something that would shock everyone I know!! The story leads to a very dramatic conclusion, with yet again lots of twists and turns and heartbreak and relief. The story didn't have a perfect happy end which I actually loved. Its so much more 'realistic' to have sadness & not be completely lucky. This is without doubt my favourite book of the year so far, quite possibly one of my all time favourite books. It has everything humour, love, action, heartbreak, deception, fear and DEATH! You would be stupid to not get this book. Go and pre-order it now YOU WILL NOT BE SORRY!!!! !